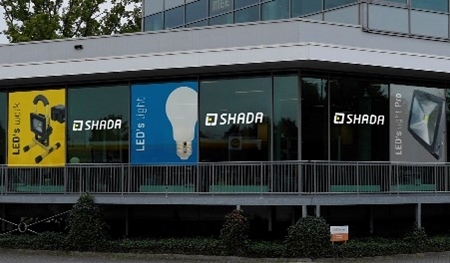 Shada B.V. is importer and wholesaler for LED lamps, LED fixtures and accessories for LED lighting. With over 10 years of experience in the lighting market, we can provide optimal and expert advice. The best LED lamps and products for almost every utilization. We are THE LED specialist with a wide range of products: Outdoor lamps, ceiling lamps, garden lighting, LED panels, spotlights, flashlights, worklights, floodlights, LED strips, LED tubes and lamps in various sizes and fittings, such as E14 E40 and E27 fitting or lamps with special fittings such as GU10, G9, G4 or T8. Shada supplies good quality products in the field of LED lighting, for a fair price. We deliver our products exclusively to the business market. We are supplier for both wholesale and retail stores, mainly in the Benelux, Germany, Switzerland and Austria. We have an extensive design team, are specialists in OEM and FOB deliveries and deliver products throughout Europe. Shada B.V. was founded on 20 September 2007 by Jos Boas Berg. The head office is located in the Netherlands (Apeldoorn), but we also have an office in China and Germany. Customer satisfaction and product quality are always central to us. To make this possible, we are active for you from 3 locations worldwide. In order to guarantee a good and fair product quality for all products, we also test all products extensively ourselves, in addition to the required tests. That is why we maintain our own laboratory at the Apeldoorn location with an Ulbricht sphere and aging space. The light solution for in and around the house. We offer everything from loose LED lamps and LED tubes to fashionable fittings and ceiling lights. Outdoor lamps and mood lighting can also be found with us. Staircase lighting or television lighting are possible with our LED strips and we also have night lights or lights for the cabinet or under the bed in our range. Our LED tubes are the modern, energy-efficient replacement for fluorescent tubes. Our twisted filament lamps are also an attractive addition to your interior. Our light sources are available in all shapes and sizes. Candle shape, spherical, tubular or the well-known bulb. The lights are available with GU10, GU4, G9, T8, E40, E14 or E27 fitting. LED's work offers you everything for the workshop. Think of safe and reliable light solutions such as LED construction lamps that are resistant to rain and dust. These floodlights have sturdy wiring and are suitable for outdoor use. They are available in different models with a rechargeable battery or with a cable. We also have worklights and flashlights with a large luminous flux (Lumen), in order to be able to use good lighting in hard-to-reach places. The solution for every lighting project. Office lighting, illumination of shop displays or for industrial applications, such as stables. Think of our LED tubes, ceiling lights, LED panels or spotlights. Shada offers you the right solution for your project! Contact us for more information or advice. We look forward to working with you. SHADA LED's lights ✓ for home ✓ for work ✓ for life!